Reading the fine print on food and beverage labels. When you reach for a food that fits in your hand—be it a beverage, a bag of chips or a can of soup—it’s natural to assume the container is one serving and the calories listed on the Nutrition Facts panel reflect that. That’s not always the case. You have to read the panel closely to really understand how many calories you are getting (even on Odwalla—a healthy beverage, brimming with vitamin-rich fruit). The good news: the Food and Drug Administration recently vowed to consider reforming food labels to be clearer and more useful to consumers. Ingredient List: We like it when our fruit drinks are made mostly from, well, fruit. The ingredients list on this Odwalla beverage reveals orange juice, strawberries, apple juice and Concord grape juice. 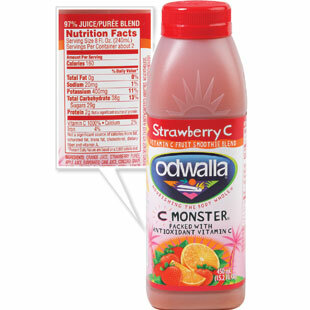 Nutrition Facts: This Odwalla beverage contains 1,000 percent of the recommended daily value of vitamin C, a potent antioxidant that mops up free radicals. Vitamin C also contributes to a healthy immune system and promotes healthy skin. Serving Size: But wait! Did you notice that the serving size is actually only about half of the 15.2-ounce bottle? (A standard soda can is 12 ounces.) Seriously, who stops at half? If you drink the whole thing, you’ll get double amounts of everything. This means you’ll have consumed 320 calories—which may be more than you bargained for if you thought the bottle supplied 160. Can a breakfast cereal boost your immunity?